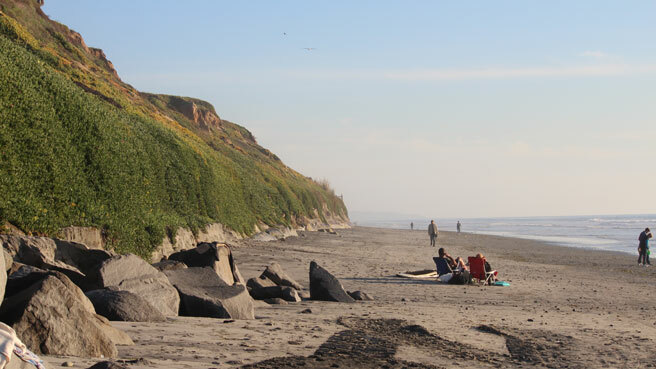 Popular for its campground on the bluffs, South Carlsbad State Beach is well-loved among families for surf, stone-collecting and its tranquil scene. While you’ll have to walk to reach any amenities, your best bet is to park at South Ponto and spend time exploring the long, narrow beach. Atmosphere: Protected by sand dunes, South Carlsbad State Beach is more private than Carlsbad State Beach. The surrounding area is primarily residential and lacks in services you might want on a vacation with a baby. You’ll find less tourists here and more campers and local residents. Parking and Entrance: Park on Hwy. 1 in one of the few spots on the sand or pay to park in South Ponto lot with easy access to the bathrooms, shower and a short packed-sand entrance. Nice Walks and Views: There’s a short, stroller-friendly walk to a bluff overlook just south of the pay lot, but you’ll have to park and walk back up to the highway and around to reach it (only handicapped parking is available at the trailhead). Also, with a baby carrier, you can walk on the beach from the jetty to the narrowing bluffs. Activities for Toddlers: Toddlers will delight in the stones piled up near the entrance of South Ponto. For a sitter or a crawler, the rocks and seaweed on this beach can be just as exciting as LEGOLAND! Bathrooms: Public bathrooms are only at South Ponto, and are big enough for changing clothes. All sinks are outside for easy cleaning up yourself or baby. Perks for Parents: Surfing at Ponto is popular, and volleyball poles are available if you bring your own net. Where to Stay with Kids: If you’re not brave enough for camping with a baby at the South Carlsbad State Beach campground, stay at the luxurious La Costa Resort (avoid summer for better prices) and have a drink while your toddler plays in the sand-entrance pool. Baby-friendly Restaurants: Nothing within walking distance, but a nearby strip mall has El Pollo Loco and a great walk-up fish place called Pelly’s Fish Market. Try their Loco Moco, clam chowder spooned over Spanish rice. There are also cheap Mexican restaurants just south along Hwy. 1 in Leucadia near Beacons Beach. What Else to Do: Carlsbad is home to LEGOLAND, the Sea Life Aquarium, and the Museum of Making Music.